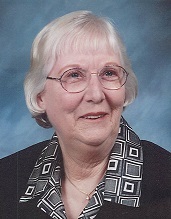 Lorna Mae Thumann, daughter of George and Wilhelmina (Kuhlman) Bliss was born on April 23, 1931 at Bruning, Nebraska. She passed away peacefully on Tuesday, November 20, 2018 at Blue Valley Nursing Home in Hebron, Nebraska at the age of 87 years. Lorna was baptized in 1931 by Rev. Cronek at Trinity Lutheran Church in Bruning. She graduated in 1948, Valedictorian of her class at Bruning High School. Lorna was married to Billie J. Thumann on October 25, 1949 in Warrensburg, Missouri. To this union four children were born: Michael, Elaine, Joel and Brett. Lorna was a switchboard operator for LT&T in Hebron until they went to dialup. She worked for the clerk’s office in the Thayer County Courthouse for many years. She also worked in the office at the grain elevator in Trumbull and as a dental receptionist in Hastings. Lorna’s greatest joy was the visits from her grandchildren, great grandchildren, nieces, and nephews. Lorna will be forever remembered by her sons, Michael Thumann and wife Lynn of Hebron and Brett Thumann and wife Linda of Belleville, Kansas; daughter Elaine Krueger and husband Mike of Roundup, Montana; grandchildren Sean Thumann of Dewitt, Nebraska, Brady Thumann of Hebron, Shay, Sam, and Ava Thumann all of Belleville; and great grandchildren Zane and Riley Thumann both of Lincoln, Nebraska. She is also survived by several nieces, nephews, other relatives and friends. Lorna was preceded in death by her parents; husband Billie Thumann, son Joel Christopher Thumann; sisters Wilma Mahloch and Lela Martin; and brothers George Bliss, Lee (Louie) Bliss and Kenneth Bliss. Funeral services were held Saturday, November 24, 2018 at Trinity Lutheran Church, Bruning, Nebraska with Pastors Stuart Sell and Keith Brozek officiating. Janice Fintel played the organ for the congregation singing “Amazing Grace”. Recorded music was “Supermarket Flowers” by Ed Sheeran and “Home” by Chris Tomlin. Casket bearers were John Remmers, Dale Remmers, David Remmers, Ed Bliss, Marlin Mahloch and Zane Thumann. Honorary Bearers were Sean, Brady, Riley, Shay, Sam, and Ava Thumann. Interment was in Bruning Lutheran Cemetery. Memorials are suggested to Hebron Secrest Library. Price-Urbauer-Ahrendts Funerals Homes of Hebron, Davenport, and Deshler, Nebraska was in charge of these arrangements.